WASHINGTON, DC -- President Truman was a lifelong student of history and wove its various lessons into his day-to-day decision-making. In words that relate to what Truman historian Elizabeth Edwards Spalding called the "timeless struggle" between the forces of freedom and tyranny, Truman said "It was the same thing ... in Greece and Rome as it is now. ... The only thing new in the world is the history you don't know." Well, one area of the world where the "timeless struggle" between the forces of freedom and tyranny continues is in eastern Ukraine. Air Force Gen. Philip Breedlove, NATO's supreme allied commander, recently told the Senate Armed Services Committee that Russian military forces are using the current cease-fire to strengthen their command-and-control presence in that region, build up equipment stockpiles and further integrate Russian-separatist force structures. In a blunt and bleak assessment of the situation, Ukrainian President Petro Poroshenko simply said that "war could start at any moment." But is this ongoing Russian incursion into the sovereign affairs of a neighboring country something new in the world? In 2008, Russian President Vladimir Putin authorized an invasion of neighboring Georgia on the grounds that ethnic Russians were not being adequately protected by the Georgian government. And Russian troops continue to hold ground in that nation. Since that invasion, pundits and military scholars have tried to dissect Putin's imperialistic impulses and many have concluded that he, as a former member of the Soviet Union's KGB, continues to yearn for the day when Mother Russia, like the Soviet Union of old, can spread its sphere of influence and control well beyond its current borders and take its place at the apex of world powers. Actually, it wasn't too many decades ago that another American president saw that same imperialistic impulse continue to unfold and decided to fight it every step of the way. President Reagan formulated the so-called "Reagan Doctrine" to "roll back" Soviet aggression around the world and stepped up financial support for Operation Cyclone, started in 1979, to provide lethal military aid to Afghan rebels fighting Soviet troops in Afghanistan. By 1987, the U.S. government was spending hundreds of millions to help the rebels fight the invading Soviets, and that aid clearly helped the rebels inflict huge casualties upon the Soviets, which in turn forced their eventual retreat from that country. 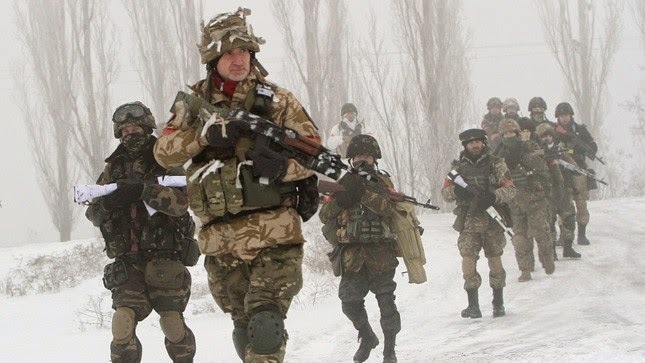 Fast forward to today, where that old Soviet Putin has once again sent his soldiers across the border into another sovereign nation and that nation, Ukraine, has been pleading for lethal military aid from us so they can stop these forces of tyranny. Just last September, Poroshenko stood before a Joint Session of Congress to thank the U.S. for the night-vision goggles and blankets we have already provided his country. But he went on to say: "But we cannot win a war with blankets!" He then correctly cast his country's continuing struggle as one between freedom and tyranny, just as Elizabeth Edwards coined it so many years ago, and as Reagan recognized the Soviets' imperialistic threat in his decision to implement the Reagan Doctrine around the world. Unfortunately today, President Obama does not appear to fully understand the essence of the struggle underway in eastern Ukraine between freedom and tyranny or, if he does, he fails to appreciate the historic imperative of using American military assistance to once again beat back the lawless aggression of an imperialistic ruler. Of course, no one advocates sending American ground troops into the fields of eastern Ukraine, and Reagan knew that he didn't have to do that [in Afghanistan], either. He understood that the freedom-loving people in their own country will do that vital work if properly supported and armed. Yet despite the growing calls in support of increased military aid to Ukraine by both Republicans and Democrats alike in Congress, along with increasingly supportive statements by various administration officials before congressional committees, Obama has refused to move forward with the authority already provided to him by Congress last December to better support and arm the Ukrainian freedom fighters. In making critical decisions, President Truman knew that the past offers clues and examples of what to do and not to do in handling the crises of the day. From watching the unchecked expansion of Nazism during his early years, President Reagan firmly understood that the expansion of the imperialistic Soviet Union had to be countered with military aid and assistance to the freedom-loving countries in the Soviets' cross hairs. Today, Vladimir Putin continues the march of tyranny in Ukraine and President Obama has the power, authority and bipartisan support to oppose it with lethal aid. So the fundamental question is: Why won't he provide it? "Mr. President, Harry Truman and Ronald Reagan are on the line, and they would like to speak with you."